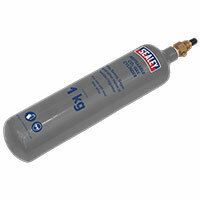 Portable sized CO2 refillable gas cylinder for the jobbing welder. Gives value for money repaying investment in just a few fills. Suitable for Sealey Mightymig? welders. Will also fit other makes of welder/regulator. Refill exchange service available through local distributors. Ideal for protection, rain or shine, against weathering and fading." - "
Two layer cover for extra protection." - "
Inner layer is made from soft anti-scratch material to protect vehicle" - "s paintwork." - "
Elastic corners for easy and secure fitting." - "
Side-opening zip to allow access to the car when covered." - "
Supplied with waterproof storage bag."